Can mobile apps save customer loyalty programs? An article in Customer Relationship Management magazine posed this question back in their May issue. Consolidation is key, as most consumers don't have the wallet space for a stack of loyalty cards. That, and without constant use, they're usually out of sight and out of mind. Using mobile applications, consumers could use their smartphone as a one-stop device for accessing their loyalty programs. Several retailers have already successfully implemented mobile loyalty apps. That comes as no surprise. With the rise of smartphone popularity, a push for simplicity and a decline in reward card usage, it's no wonder retailers are altering their loyalty programs. Take a look at Starbucks. This year, they rolled out a mobile app that allows customers to link a credit card and pay with their phone. With the app, you can access your Starbucks Card balance directly from your phone. And, you can reload your Starbucks Card using any major credit card. The app provides you with a unique barcode that links directly to your gift card. To pay, the cashier simply scans the barcode on your phone and your amount is deducted from your balance. In addition, the app provides a built-in loyalty program. With each purchase, you earn stars. And - you guessed it - the more stars you earn, the bigger your perks. With five stars, you reach "Green Level" and will enjoy such perks as free select flavored syrups, free soymilk and a free tall beverage with each pound of coffee, among others. 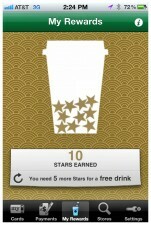 After you collect 30 stars, you earn "Gold Status" for one year and are treated with a free drink for every 15 stars you accumulate, a personalized gold card and personalized offers, among others. There are several other examples out there of mobile applications enhancing customer loyalty. Foursquare is most used for checking in to venues and letting friends know your where-abouts. But, retailers are using it as a way to earn loyalty by rewarding check-ins with discounts, freebies and incentives to become the mayor. What other companies or start-ups are utilizing mobile apps for customer loyalty? Do you think it's a good idea? Do you see it gaining popularity in the future? Sound off in the comments section. We've already discussed how mobile devices are going to be the next new loyalty card. Many companies have already utilized the "Specials Nearby" feature on Foursquare, which allows users to view sponsored messages by companies near where they've recently checked in. Foursquare already has a points-based system into their program where users earn points for their number of check-ins, first time visits etc. What if companies utilized those same systems?